A stucco application that is installed properly can last for more than one hundred years. Although stucco is quite durable, it may still develop cracks, blisters or sustain impact damage. When this occurs you need to have a stucco repair contractor that is experienced and reputable such as Confident Coatings. We are the Colorado Springs stucco repair experts! As a professional stucco repair company in Colorado Springs, we have the necessary experience for getting your project done right on the first try. 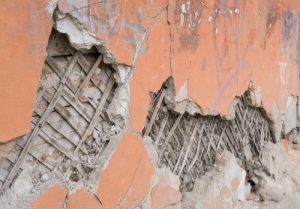 The most important step in the entire stucco repair process is assessing what the scope of your stucco repair project is. The first step in the damaged stucco repair process is inspecting the property for any damage. Does just one small patch need to be repaired? Does a large surface area need to be redone? If you guess wrong here, and you hire a handyman for doing a simple patch job that really needs to have a larger project done can end up being a very costly mistake. Here in the Colorado Springs area, the soil can contain a lot of clay or be very sandy. This results in commercial and residential building foundations having a tendency to shift and can lead to settling cracks. Those foundation cracks can easily transfer to the stucco finish on your home, creating clrack, peeling, blisters and other stucco failures. Another common problem that we have in the Colorado Springs area is storm and water damage. As this area continues to grow, exterior wall changes and additions are other common projects that we do. Accidents do occur, and whenever they do, impact damage can have a negative effect on stucco. Improper flashing and caulking failure can result in water damage. Whether you need stucco repair for a commercial or residential building, and whether it is minor or major, our skill craftsmen can repair your stucco successfully and get the job done efficiently and quickly.